Allium is a monocot genus of flowering plants, informally referred to as the onion genus. The generic name Allium is the Latin word for garlic. Members of the genus include many economically important crops and garden vegetables such as onions, shallots, French shallot, leeks, scallions, and herbs such as garlic and chives. Allium species occur in temperate climates of the northern hemisphere. They can vary in height between 5 cm and 150 cm. The flowers form an umbel at the top of a leafless stalk. The bulbs vary in size between species, from very small (around 2-3 mm in diameter) to rather large (8-10 cm). In most cases, both bulb and leaves are edible. Their taste may be strong or weaker, depending on the species. We found this plant at a rare plant show many years ago. Plants grow to 35cm from early winter through to summer. In summer the foliage dies down back to its bulb. 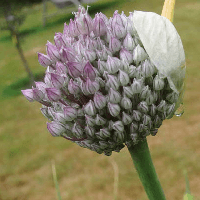 Perennial Leeks have a 1m height flowering spike with a typical Allium flower on top. During the growing season the mature leaks regularly measure 2cm in diameter and 30cm in height. Leeks are good for soups, on their own or as flavor for casseroles.